It’s the year 2762. The galaxy is plagued with warring factions using hokey special effects to destroy each other. Out of this chaos a hero rises - the dashing, exquisitely bearded Captain Saber Raine (Casper Van Dien). Saber and his elite squad of commandos (other actors) embark on a dangerous quest to save the Prince and Princess of an unnamed planet from the clutches of the Evil Overlord Sinjin - an Overlord so evil HIS VERY SKULL IS FILLED WITH CHERRY JELL-O. Don’t believe me? YOU WILL! Can our heroes fend off Sinjin’s army of mutant androids and rescue the Prince and Princess? Probably! After all it’s Space Opera, but you never know! 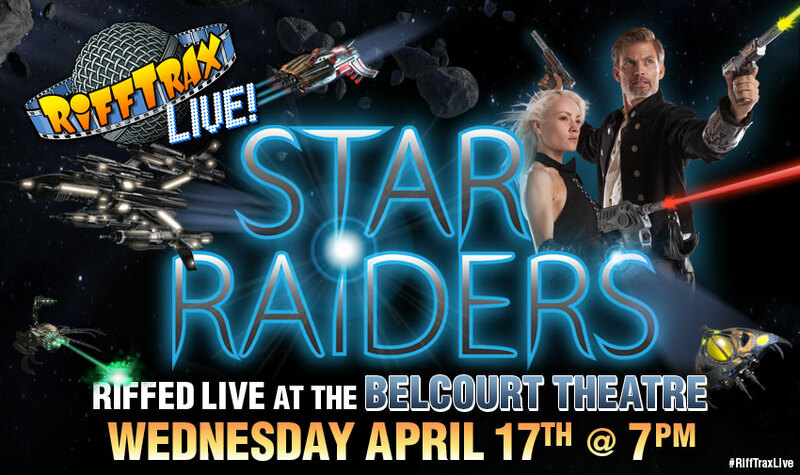 Join Mike, Kevin and Bill for an unforgettable Sword-And-laser Swashbucklingly fun time, live and in person at The Belcourt Theatre! RiffTrax Live Line Instructions: RiffTrax will use a line hold system to let everyone check in and reserve a spot in line, then leave and come back later to your held spot. Starting at 12 noon, people can check into the Belcourt's box office and present their ticket. You will then be issued a card with your line spot number. The number on your card dictates your spot in line. Go out and relax or go grab something to eat knowing your spot in line is reserved. Return to the Belcourt with your ticket and your line spot card no later than 6:00 pm and get in line based on your number. Doors open at 6:20. Someone from the Belcourt will be on site to assist you if need be, but you should be able to find your spot by talking with other people in line. It’s just like Southwest Airlines but with actual comedy! Note: If you lose your line spot card you will lose your spot in line and have to go to the end of the line. If there are more than one of you, please bring ALL the tickets to get multiple cards, one card will be issued per ticket. The line spot card does not replace your ticket so please hold onto your ticket and bring it with you when you come back to the Belcourt.